↑ अ आ Scamardella, J. M. (1999). "Not plants or animals: a brief history of the origin of Kingdoms Protozoa, Protista and Protoctista" (PDF). International Microbiology. 2: 207–221. ↑ Rothschild, L. J. (1989). "Protozoa, protista, protoctista: What's in a name?" (PDF). Journal of the History of Biology. 22 (2): 277–305. डीओआइ:10.1007/BF00139515. ↑ Copeland, H. F. (1938). "The Kingdoms of Organisms". Quarterly Review of Biology. 13 (4): 383. डीओआइ:10.1086/394568. ↑ Whittaker, R. H. (1959). "On the Broad Classification of Organisms". Quarterly Review of Biology. 34 (3): 210. डीओआइ:10.1086/402733. ↑ Cavalier-Smith, T.; Chao, E. E. Y. (2003). 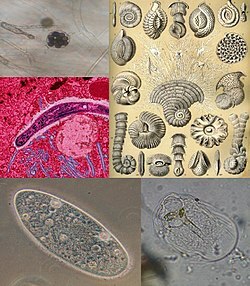 "Phylogeny and classification of phylum Cercozoa (Protozoa)". Protist. 154 (3–4): 341–358. डीओआइ:10.1078/143446103322454112.